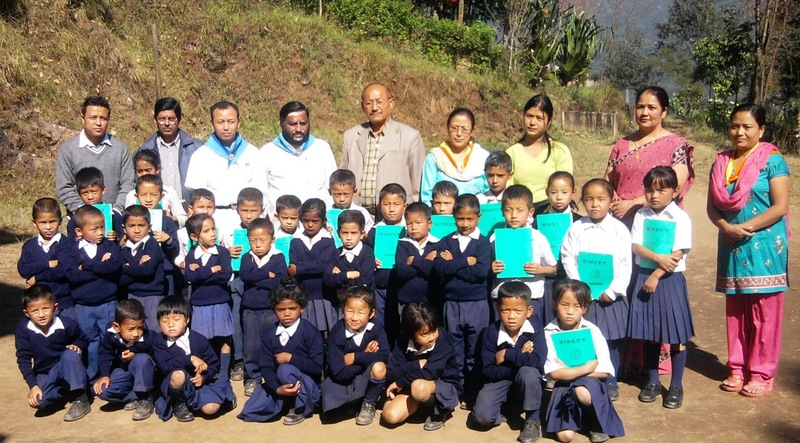 The five day programme of Sri Satya Sai Baba Samiti Sombarey West Sikkim , started from GJHS Rumbuk with the Seva Dal attending the school and provided service to the student, by cutting nails , combing hair and cutting hair and giving tips on health and hygiene. The organization also provided free school sweater for class I, free copies for class II student and free creative drawing copies for class III and biscuit for all student. The team of Sewa Dal from the organization comprising of Mr. Uphar Pradhan, Seva dal coordinator, Mr. Harka Narayan Pradhan, Youth Convener and Mr. Binod Chandak Seva Organizer along with five other female Seva Dal were present on the event. Mrs. Laxmi Sharma Seva Dal on her speech said that this day is special day as it is observed as women’s day as it is the birthday of Late Mrs. Indira Gandhi and the beginning of five day celebration programme to marks the 86th Birthday of Bhagwan Sri Satya Sai baba which is on 23rd Nov. The organization celebrates the special day by providing selfless service to all the people and children. The other programme is to visit a rural area in Beyoung for the service. And grant celebration on 23rd Nov. at Sombarey Mandir, it is planned with free distribution of clothes for the needy. The programme came to an end with the thanks from the headmaster for service and extended full cooperation in the future too. Later in the evening the women day was celebrated where Mrs. Y.N. Kazini and Mrs. Dimple Pradhan was felicitated for their selfless service to the society. RONGLI, NOVEMBER 12: Government Primary School Pacha Saraswati observed a program for the occasion of National Education Day by giving a unique name this year as “SIKKSHA KA HAQ ABHIYAN’. In the program the members of School Managing committee, parents, all the staff and Headmaster were present. Miss Preeya Rai a student of class V gave a short welcome speech. In the program Headmaster Mr. Ashok Gupta read the massage of Hon’ble Prime Minister and Hon’ble Chief Minister. After the speech all the students, teachers and SMC president, MTA along with Headmaster participated in the Rally related to RTE act with play card and banners. Mr. Dinesh Bhattrai PRT of the school gave speech on awareness on Right to Education. Mr. Mekman Gurung was the Chief Guest of the program. Students of the school participated in the different program like quiz competition, dance, singing etc. At the end of the program prizes and sweets were distributed to the winner students. SINGTAM, NOVEMBER 12: Government Primary School, Sawaney, West Pandam observed National Education Day on November 11, 2011 at its school premises. Cultural activities and rally was the highlight of the occasion. Mohan Pradhan, Headmaster of Sawaney PS gave the welcome speech that was followed by a Prime Minster message read by himself and the message from Chief Minister that was read by Ganesh Pradhan, teacher, while BR Subba read out the message of Kapil Sibbal, Union HRDD Minister. Sunita Rai, Zilla Panchayat,West Pandam was the Chief Guest of the day that also included other distinguished guests in Dilp Rai, Buddhiman Rai, Deepak Rai,Mrs Kumari Rai, Mrs Ganga Devi Sunar,Indira Kumari Pradhan, CB Chettri and Mrs Nandu Sharma and others. Padam Gautam, teacher gave a brief speech on RTE and CCE while Dilip Rai, Harka Subba and the Chief Guest too spoke on the occasion. RONGLI, NOVEMBER 12: Dalapchand Secondary School joined hand with rest of India to celebrate the birth anniversary of India’s First Education Minister Maulana Abul Kalam Azad. The day was celebrated as National Education Day. PC Rai, Panchayat President and former Headmaster of the school was the Chief Guest of the day that also included SMC members. ST Bhutia, Headmaster of Dalapchand SS and his staffs followed by Ajay Gurung, Principal of Saraswati Sishu Vidhyalaya and his staffs and the students of both school were present on the occasion. 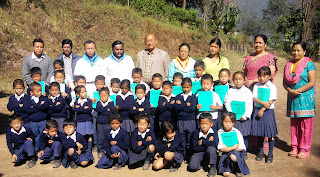 Prime Minister Message and Chief Minister Message were read by ST Bhutia, Headmaster of Dalapchand SS. Introduction of Maulana Abul Kalam Azad was read out. In his short speech, he briefed about the celebration of the education day. He told about the importance of RTE Act and other benefits for the students provided under different educational methods. Rally was held from school to Dara Goan with students carrying placards and raising slogans for compulsory education from every child. Play on need for compulsory education system for all by the students of primary section was highly appreciated. Inter House Quiz competition was also held that was won by Yellow house. The program was hosted by Sonam Dorjee Bhutia while Srijana Pradhan hosted the quiz show. Prakash Poudhyal gave the welcome speech while TN Poudhyal gave the vote of thanks. RONGLI, NOVEMBER 12: National Education Day was observed at Phadamchen Secondary School yesterday along with the felicitation to two teachers on the auspicious occasion. Shri Ongdi Bhutia, Zilla Panchayat member, 14-Gnathang Territorial Constituency was the Chief Guest on the occasion while Shri Kee Tshering Sherpa, Panchayat Secretary, Lingtam-Phadamchen GPU was the Special Guest. Also present on the occasion were Dorjee Tshering Sherpa, Headmaster of Phadamchen SS, students and teachers of Phadamchen SS, Nimachen Primary School and Good Star English School and others. CR Sharma, Senior GT Maths gave the welcome address that was followed by a rally of the three participating schools, parents, SMC members. Rally started from Phadamchen SS till Phadamchen Bazaar then back to the school and ended up at Nimachen Village. Shri Harka Bahadhur Gurung and Smt. Paden Bhutia were felicitated for their meritorious service towards the school. Students of Phadamchen SS presented cultural programs that were enjoyed by everyone. Dorjee Tshering Sherpa, Headmaster of Phadamchen SS in his speech stressed about the Right To Education Act. He also briefed the gathering about the occasion of National Education too. Ongdi Bhutia in his speech requested the parents to guide their wards properly. He also informed about the various schemes of the government. Mr. Rinzee Sherpa concluded the program with his vote of thanks. RONGLI, NOVEMBER 12: BAC Regu/ HRDD / East organised sub- division level programme at Rongli Bazar on National Education Day, the birth anniversary of Maulana Abul Kalam Azad, India’s first Education Minister on 11th November 2011. The programme was attended by BDO, BAC/ Regu Sheri Dhiraj Pradhan as a Chief Guest followed by Assistant Director, HRDD/ BAC/Regu Shri Chador Bhutia , SDPO Rongli, P I Rongli, Principal/Headmaster and teachers of different govt. and private schools of Rongli surroundings ( Rongli JHS, God Sunn’s Prep. School, Sunrise Model School and Bidhya Bharati School) Staffs of Regu BAC, SMC members, guardians, local public and students of government and private schools. The programme started at 10.30 am with warm welcome address by AEO, BAC Regu/ HRDD, Deepak Rai. The host of the day, Krishna Pd. Dawari, CRC Coordinator highlighted the importance of the day and presented the brief biography of Maulana Abul Kalam Azad. The message of Hon’ble Prime Minister and Hon’ble Chief Minister read out by Chief Guest Shri Dhiraj Pradhan, BDO, BAC/ Regu and AD, HRDD/ BAC, Regu Chador Bhutia respectively. Headmaster, Rongli JHS Ganesh Chettri gave speech on Right To Education Act 2009. He informed the responsibilities of Department, Schools and Teachers and the local authority to fulfil the objectives of Act in his speech. A huge rally was organised in which large number of people participated. Chief Guest, Guest, AD and Staff of BAC, head of institutions and staff of govt and private schools, SMC members, Panchayats, guardians, public and students took part in the rally. The rally started from Garg Bhawan to Rongli Bridge and ends at Garg bhawan, Rongli bazaar. With placards and banners displaying slogan on education and RTE. Colourful cultural programme was also presented by students of Rongli JHS. The main attraction of the programme was street play based on the theme of RTE Act presented by Culture Department, Govt. of Sikkim on the direction of Deepak Sharma, Music Teacher, Dalapchand SS. The programme was concluded with vote of thanks by teacher, Rongli JHS, Bhim Pd. Chettri. 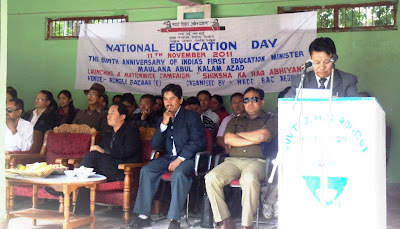 Further the National Education Day 2011 was also celebrated by different Sr. Secondary, Secondary, Primary and private schools under HRDD/BAC Regu on the same day. RONGLI, November 12: Dalapchand Secondary School bid a colourful farewell to their two former teachers at the school premises on November 10. The two teachers, Miss Shreya Pradhan had been transferred to Aritar SS while Mr. Phurba Tamang had been transferred to Land and Revenue Department, Khamdong BAC. Present on the occasion were ST Bhutia, Headmaster of Dalapchand SS along with his staffs, students, former students and few local villagers. The few hour long programs was hosted by Karma Bhutia, senior teacher. Madhu Regmi gave the welcome address while NR Sharma, senior teacher gave a short speech representing the teaching staffs. Students displayed exciting cultural programs to entertain the gathering. Ishwar Dawari, School Captain recited a Nepali poem for the departing teachers. ST Bhutia, Headmaster in his speech informed the gathering about the role played by the two outgoing teachers in the development and progress of the school and they will be missed, Bhutia said. Bhutia also wished them many more success in days to come in their respective professions. UN Mishra, Maths PGT gave the vote of thanks. Phurba Tamang and Shreya Pradhan in their speech thanked the entire school staffs for their cordial relationship and support in their short staying. Shreya Pradhan, had worked at Dalapchand SS for last two years while Phurba Tamang, had joined the school as a non teaching staff last August.